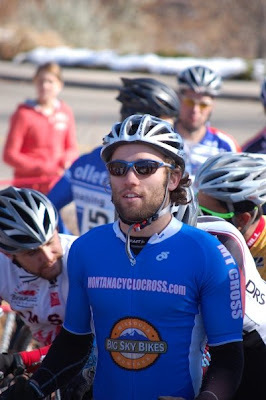 Montanacyclocross.com photographer Mike Hermsmeyer hooked us up with some sweet shots of Mariano from last weekend. To view Mike's Facebook album, click on this link and become his friend on Fbook. Mikey H borrowed his sisters expensive camera for the weekend. Spectators were asking him what magazine he was shooting for. Mike replied with Montanacyclocross.com! Ha! I love it. Thanks for repping us in Boulder Mike! Mariano raced in the snow and mud on Saturday. He said it was quite the adventure. Much different then racing in Montana. He took a couple bad crashes and was un-able to roll Sunday. Props to EB for making the trip out and repping Montana. Muleterro Mulecross 2009 from samh on Vimeo. Early reports are in. Karl Vanderwood has won his first Montana race of the season. 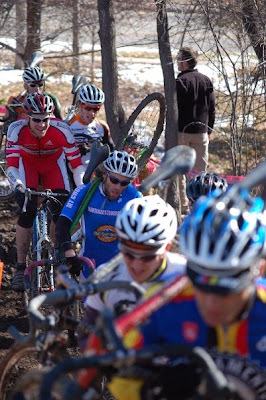 KV took the win at a well attended Mulecross. Team Muleterro provided an excellent atmosphere, complete with Cory Hardy on the mic. LCurry won the ladies race in a wolf mask. Second in the men's race was Scotty Herzig who's form looks to be coming around in time for the state championship next weekend. Congrats Mules on a successful event! Look for photos on the Mulecross Blog.